We recognize that emergency dental situations will arise and although it can be very scary, we will do everything we can to get you out of pain. Dental emergencies can occur at any time, any place, and they can be very painful. A throbbing toothache, severe pressure or trauma can pop up at any time and it can be too much to endure. When a dental emergency arises, give us a call! Call before noon and we guarantee that we will see you the same day! If you have an emergency during non-business hours, give us a call and our emergency voicemail service can get you in touch with one of our doctors! Whether you are traveling or at home, the following information can help you assess your dental emergency and manage the situation until you can come see us. Teeth that have been knocked out knocked loose, or knocked out of alignment is a dental emergency that requires immediate attention. If you suffer from trauma to your mouth, give us a call right away and follow these instructions to give your tooth the best chance of being saved. If your tooth has been knocked loose or out of alignment, do not attempt to reposition the tooth. Call us right way so that we can examine your tooth and handle the situation. Call us immediately! Getting to the dentist quickly with your tooth is critical for saving the knocked-out tooth. The quicker the tooth is re-positioned, the better the odds of the tooth “taking” and remaining viable. Gently pick up the tooth by the top (crown) of the tooth. Do not touch the root(s) of the tooth. Rinse the tooth off very gently to ensure that it’s clean. Do not scrub the tooth or remove any tissue attached to it. Be sure to place a towel in the sink so that the tooth is not accidentally dropped down the drain. Put the tooth in a cup of milk. If milk is not available, place it in a clean container. Bring the tooth with you to the dentist. Any type of injury to the gums, cheek, tongue or lips is considered an emergency. You should either call your dentist or visit the emergency room depending on the severity of your injury. Clean the area immediately with warm water and place firm pressure on the area with a clean towel or gauze to help control bleeding. If your tooth suddenly chips or cracks and it is not hurting, it is typically not considered a dental emergency. Prior to seeing the dentist, it is important to be careful when chewing as to not chip or fracture your tooth even more. Give us a call to schedule an appointment so that we can protect your tooth and prevent it from breaking further. A severe toothache can begin at a moments notice and the pain can be too much to tolerate. 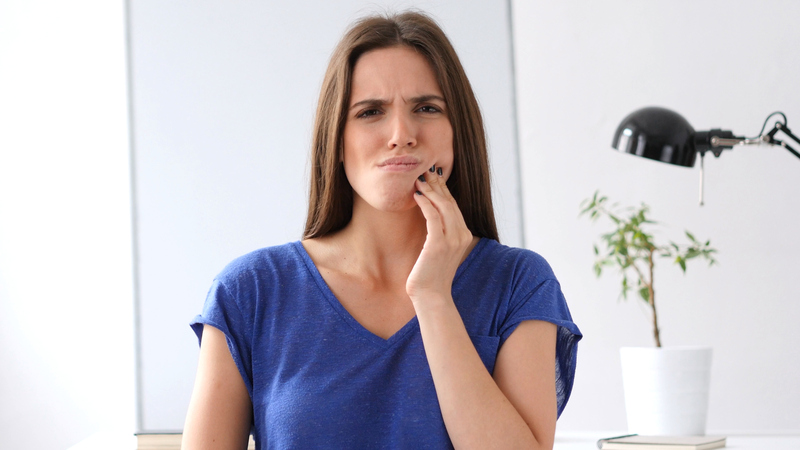 In certain cases, dental pain is caused by a dental infection or abscess. This can come in the form of sharp shooting pain, pressure pain or a dull toothache. If the infection continues to grow, it can spread to other areas of the face causing the face or cheeks to swell. Severe infection can spread to the area below the tongue and neck which can cause the airway to close. If you notice swelling of your face or neck and have difficulty breathing or swallowing, call 911 immediately or visit the nearest emergency room. Temporary crowns are used to protect teeth and prevent shifting of the teeth while the permanent crown is made in the dental laboratory. If you have a temporary crown come off, it is important to put it back into its place until you can see your dentist. You can easily place your temporary back on by applying a small amount of Vaseline, toothpaste or denture adhesive inside the temporary and gently place it back onto your tooth. The temporary crown will only go on once it is in the correct position, so do not try to force it back on. Also, NEVER put your temporary back on using any type of glue. Give us a call and we’ll be happy to re-cement your temporary until your permanent crown is back from the lab. If you have any questions or concerns regarding your dental emergency, contact us! Our team is here to help! We believe that each patient should be informed and educated about their current dental health. This understanding of your dental and oral health will allow you to make educated decisions regarding all of your treatment needs and various treatment options. We work together to develop a customized treatment plan that works for you! This collaborative team approach is vital to ensuring the most positive dental experience possible in a relaxing and comfortable environment.